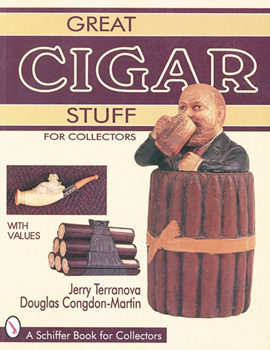 This book is a compendium of cigar-related "stuff," from the old cigars in their original wrappers still ready to smoke, to the fine humidors that have kept them fresh for decades. Here is the breadth of advertising, ashtrays, matchsafes, cigar boxes, dispensers, and holders that have adorned homes and shops for 100 years and more. Terranova and Congdon-Martin, co-author of Antique Cigar Cutter and Lighters, present herein more than 500 items in clear, full-color photos, with informative captions and a current price guide. Sure to be a welcome addition to the literature of "tobacciana."